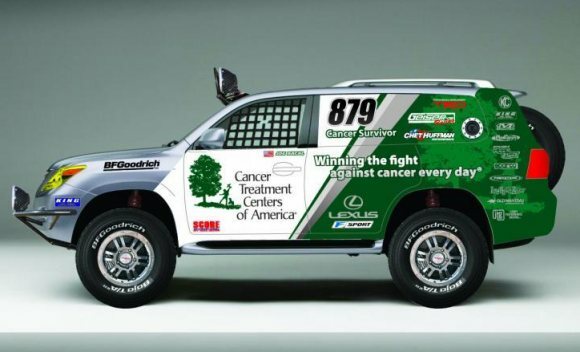 Piloting their newly-built Cancer Treatment Centers of America JTGrey Racing Lexus LX 570, Joe Bacal and navigator Paul Williamsen took their truck to its maiden victory in the 41st annual Tecate SCORE Baja 500 early Sunday. Their win in the Stock Full class marks a first for Lexus and Bacal’s team. Bacal says the LX 570 was bulletproof and went the entire distance without a tire change. Assisted by first-time navigator Williamsen and a new team, Baja 500 rookie Bacal drove all 16 hours of his race without leaving the vehicle and with only brief stops for fuel and nourishment along the way. They moved the big LX into the class lead a little before the halfway point and were never overtaken again. The LX 570 build-up had been completed just days before the race and was tested only briefly in Arizona before shipping to Ensenada for the race. The dusty, rocky and alternately fast-slow Baja 500 course took its toll on many competitors. It crossed mountains, dry lake beds and even ran alongside the Pacific Ocean for several miles. It did manage to take a small bite out of the LX when an anti-roll bar link failed, but Bacal simply adjusted his driving to accommodate the degradation in handling and soldiered on. It proved to be a smart strategy. Bacal and the JTGrey team look forward to their next race in late summer when they challenge the Vegas to Reno 1000 in the Best of the Desert series on August 19-23. JTGrey Racing was created by Joe and Teresa Bacal in 2008 to support Joe Bacal’s off-road racing efforts. It is based in Phoenix.